Rambo: The Video Game wasn’t a good game when it came out in February 2014, and not much has changed in the last two years. So when the game’s publisher quietly stopped talking about DLC, it wasn’t surprising. But lo and behold, that DLC is coming out. Why’d it take two years? I asked. Chances are you didn’t play Rambo: The Video Game, an on-rails shooter for Xbox 360, PlayStation 3, and PC that was quickly forgotten. It was a good opportunity to rewatch the movies, I guess? Despite the negative reaction, publisher Reef Entertainment planned to support Rambo: The Video Game for the people who enjoyed it, which is commendable. OK, sure, development is bumpy and things take time. But after July 2014, the company went dark. Reef didn’t update their Twitter account a single time after July 9, when they released another screen for the expansion. There was every reason to suspect poor Rambo sales had killed them. This is where the story usually ends. A game publisher has high hopes for new game, so they map out additional content. But when that game doesn’t light the world on fire, they scale it back and fade away. The trailer doesn’t show much beyond a cutscene and some voiceover, and doesn’t explain how the DLC took more than two years to finish. “Well as you can imagine we never planned to release the DLC two years after the release of the main game,” said Reef representative Jaspreet Marwaha in an email. Marwaha told me development on Rambo: The Video Game was tight, and DLC was an afterthought. Since feedback from players and reviewers suggested the game was short and without enough original storytelling from the Rambo-verse, Reef intended to address both with an expansion. “Hence the decision for a free update/DLC to the game incorporating a new and original mini campaign focusing on a prequel to the Rambo story,” he said. There was a big problem: on consoles, the game hadn’t been engineered to accept add-ons. The developers could tweak the game with patches, but to pass things certification on PlayStation Network and other services, they would need to work on a more ambitious update. “We were a little naïve,” said Marwaha. 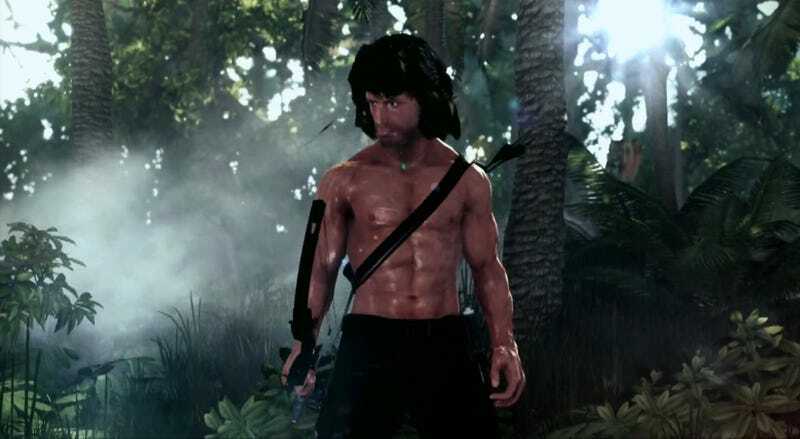 Rambo: The Video Game was the first release by Reef, an outfit that seems to specialize in video games based on existing licenses. The company’s website teases a video game based on Terminator that hasn’t been discussed since it was first announced in August 2013. Reef told me it’s still in development, alongside another project. Two years is a long time, but for those Rambo: The Video Game fans waiting around for another bout of on-rails shooting, the wait is over? The DLC is available on Steam and PS3 as of yesterday.